In this book I try to give a coherent and consistent overview of what an ecological approach to language learning might look like. This is not a fully fledged grand theory that aims to provide an explanation of everything, but an attempt to provide a rationale for taking an ecological world view and applying it to language education, which I regard as one of the most important of all human activities. Goethe once said that everything has been thought of before, but that the difficulty is to think of it again. The same certainly is true of the present effort. If it has any innovative ideas to offer, these lie in a novel combination of thoughts and ideas that have been around for a long, long time. The reader will encounter influences that range from Spinoza to Bakhtin and from Vygotsky to Halliday. The scope of the work is intentionally broad, covering all major themes that are part of the language learning process and the language teaching profession. These themes include language, perception and action, self, learning, critical pedagogy and research. At the same time I have attempted to look at both the macro and the micro sides of the ecological coin, and address issues from both a theoretical and a practical perspective. This, then, aims to be a book that can be read by practitioners and theoreticians alike, and the main idea is that it should be readable and challenging at the same time. 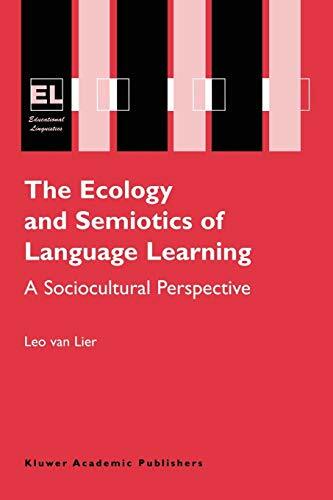 The ecological perspective on language and language education has in recent years become a major focus of interest in the fields of second language teaching and learning, and linguistics and education in general. 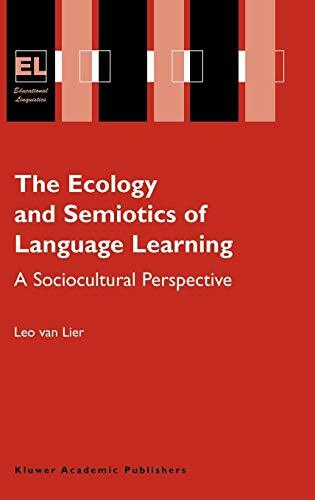 This is the first book-length attempt to provide a comprehensive overview of an ecology of language learning, including both theoretical discussions on language, semiotics, emergence, and self, and the practical consequences of an ecological view for classroom work. This book is of interest to all language educators, second and foreign language teachers and researchers, and other education professionals. Preface. Acknowledgements. 1. Introduction: Why ecology. 2. Theories of language. 3. Semiotics: The making of meaning. 4. Emergence and affordance. 5. The self and language learning. 6. Language learning pathways. 7. Critical ecological linguistics. 8. Ecological research. Epilogue for language teachers. References. Index.